I once toured a home that I thought smelled like baby powder when the wife, I’ll call her Mrs. B., first ushered me in the front door. Mrs. B’s. husband soon entered the room and was introduced to me as Mr. J. I soon learned the couple didn’t have any children so I thought I must be imagining the baby powder smell. As I was being led through their home room by room I kept thinking I must have been mistaken about the baby powder smell, that is until Mrs. B. lead me rather quickly into Mr. J’s. office. I immediately discovered the room had baby powder everywhere and I do mean everywhere. 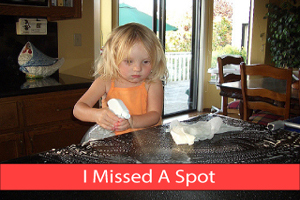 The window sills, the baseboards, the ceiling fan, the desk, and every other flat surface that I could see was covered with a fine white dusting of baby powder! You could cut the tension in the air with a knife. I noticed Mr. J’s. head droop and his manly jaws tighten. His cheeks then began to turn a light pinkish color and I myself felt sweat beginning to trickle down my own forehead. I could tell that this special couple was madly in love as we all got a chuckle at my feeble attempt to calm the potential storm that was brewing and I am happy to say the rest of the tour went well. What does this all this have to do with this article? I won’t say but if you’re curious you can read on to find out. Your carpet got gum? Grab a hair dryer, a plastic baggy, and a jar of peanut butter and get to work! First heat the gum with the dryer and the gum will quickly loosen up. Quickly press the plastic baggy into the gum which will stick to the bag as you carefully lift the bag off the carpet. This should remove most of the gum but some gum will still remain. Remove the rest of the gum with the natural oil in the peanut butter. A dollop of peanut butter will do nicely as you gently rub it into the gum and let it sit for 5 or 6 minutes. Next, wipe it up with a damp cloth. The final step is to mix 1 teaspoon of liquid dishwashing soap and warm water and dab it with a clean cloth and all of the gum should be gone. I hate the marks left on the carpet when you move a heavy piece of furniture. Though they are unsightly you might be surprised that they can be easily removed if you know how. Get your iron out and dust it off for this quick and easy carpet repair task. Oh yeah, you’ll need a common dinner fork as well. Begin by turning the iron on to the steam setting. The iron needs to be held about 1/4 inch from the tip top of the carpet nap. After the carpet fibers have collected a bit of steam use the tines on your fork to fluff up the carpet fibers back to their original position. It will happen at some time. All carpet will eventually begin to emit an odor of some sort. Carpets collect animal smells, feet odor, cooking odors, cigarette and cigar smoke, and the stench of dirt, dust, and pollution that is in the air. Instead of spending more money on a product designed to remove odors, you can use something that you most likely already have on hand — baking soda. When you need to freshen up the carpet just sprinkle some baking soda on your carpet. Leave it on your carpet for a few hours or more (even overnight) before vacuuming it up. The baking soda will absorb most odors from your carpet but if you mix it with a bit nutmeg or ground cinnamon it will leave a pleasant smell behind. Another favorite in lieu of baking soda is baby powder, the same powder I found in the lovely couple’s home. One time I stepped into a bucket of water based paint and had paint all over the carpet. 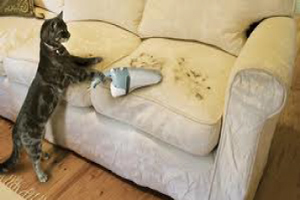 I hope this never happens to you because I had a real mess on my hands or as I said, the carpet. As I recall, I just replaced the carpet because I didn’t know about this cleaning tip to remove paint from a carpet. Now I wouldn’t go dumping a bucket of paint on your carpet to try out this next technique, but if it does happen to you, this might just work. You have to work fast before the paint sets and this tip will only work with water based paint. Jump into action by mixing 2 cups of warm water, 1 1/2 teaspoons of laundry detergent and 1 1/2 teaspoons of vinegar into a bucket. Using a bunch of elbow grease and a sponge soaked in the mixture, wipe up the paint as quick as possible. After all the visible paint is gone, rinse the area with cold water to remove any residue left over. If you catch a break, you might find all the paint has been soaked up from your carpet. I have never tried this technique out and hope I never have to but it’s comforting to know there’s a solution for a water based paint spill on a carpet. If for some reason the family pet likes to test your patience by depositing a nasty brown pile of you know what on your favorite throw rug don’t despair. The carpet can be cleaned fairly easy with this next creative idea. First, scoop up as much of the mess as you can using a paper towel. Then gather up your throw rug and head on over to your laundry sink or washtub. Flip the rug over and run warm water over the back of the rug washing the poop from the back to the front until the brown stain is gone. Why wash from the back instead of the front as one usually does? Simple, the carpet stain might wick up the fibers and show itself again when rinsing from the top down while washing from the bottom or back first tends to provide a more thorough cleansing action and is more likely to prevent the wicking phenomena. Another bonus — you won’t have to scrub nearly as much. Well, it’s time to close for this week. We hope you enjoyed this article about clever ways to clean your carpet and if so please take a few minutes to share it with others. Leave us a comment if you have an idea or two you’d like to share and thank you for taking the time to read. See you next time.